BENSON, NC (WTVD) -- An off-duty state trooper and an associate dean at Campbell University are being hailed as heroes for helping to save a driver trapped in a car that crashed into water. Trooper D. L. Braswell was off duty and taking his daughter to school when he saw a vehicle off the roadway and partially submerged in water on the shoulder of US 301 near Benson. A second person, Dr. Scott Asbill, also seeing the vehicle in the water, stopped to help. The two entered the frigid water as they heard the trapped man yelling for help. It took about 10 minutes for them to free the driver as fire rescue personnel arrived. 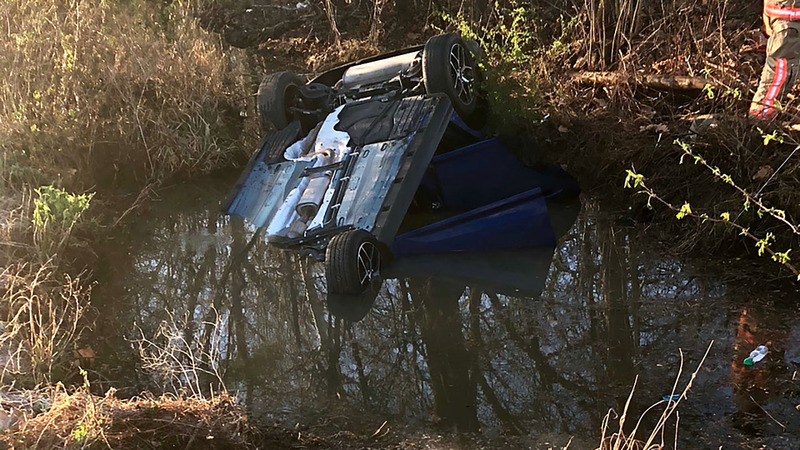 The rescued driver was identified as 20-year-old Jarrell Booker, who told authorities he fell asleep on his way home from work and veered off the road, overcorrected, then crossed the center line and went off the road to the left and into the water. The car overturned and was partially submerged. Booker was charged with careless and reckless driving. The quick action from Braswell and Asbill helped save Booker, who was suffering from "hypothermic issues," the Highway Patrol said. He was taken to WakeMed for treatment.